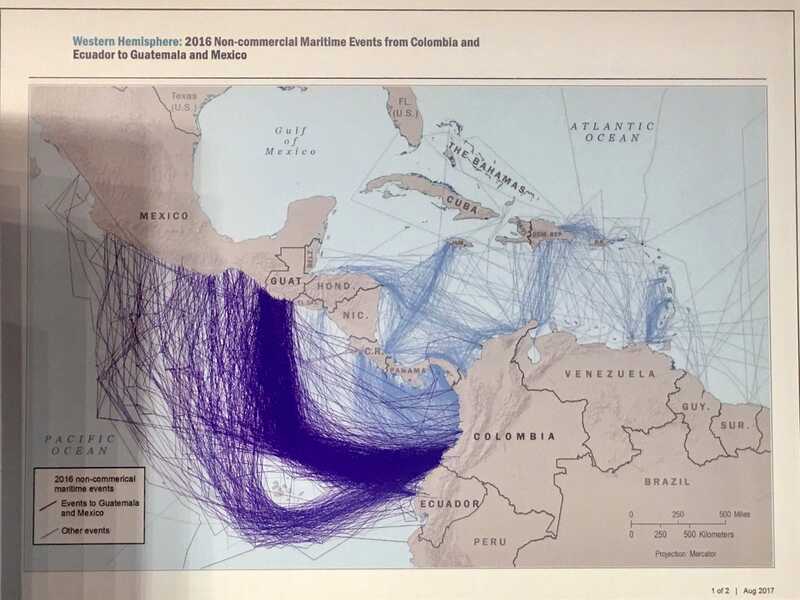 Since June, Coast Guard vessels patrolling the US's southern approaches have stopped seven low-profile smuggling vessels — stealthy ships that ride low in the water to spirit illicit cargos from South America to Mexico and the US. Akin to self-propelled semi-submersibles used by smugglers for the same purpose, low-profile vessels are boats designed to run near or at surface level to present the smallest possible radar signature. Low-profile vessels usually have a sharp bow to cut through the water and an elongated body to transport cargo — typically high-value drugs like cocaine. Some only have masts or conning towers that stick out above water, and they are often outfitted with multiple outboard engines and painted to blend in with the water. The Coast Guard said the last time a low-profile vessel was stopped prior to the current fiscal year was in late May 2016. Six narco subs were caught during that fiscal year (and one was intercepted in September, the first month of fiscal year 2017). The seven interdictions since June occurred in drug-transit areas in the eastern Pacific, off the coasts of South and Central America. US Coast Guardsmen sit atop a narco sub stopped in the Pacific Ocean in early September 2016. 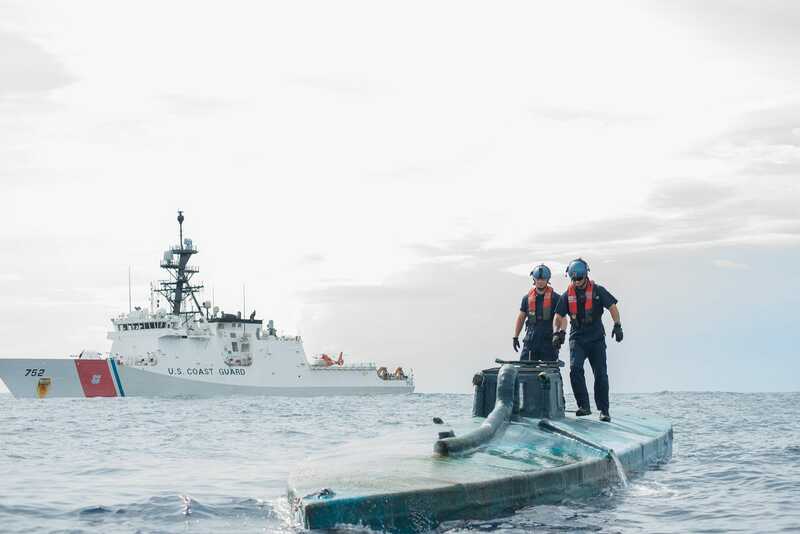 In mid-August, Coast Guard cutter Steadfast intercepted a suspected low-profile vessel several hundred miles off the coast of Central America, seizing more than 6,000 pounds of cocaine and arresting four suspected traffickers. Another low-profile vessel — six feet wide and 54 feet long — was stopped by Coast Guard cutter Waesche off the Central American coast in early June, after the cutter tracked the vessel for almost 100 miles. The Waesche's crew arrested four suspected smugglers and seized 2.79 tons of cocaine. The US and partner forces have stepped up their activity in the eastern Pacific, and cocaine production has risen considerably in Colombia, the world's biggest producer of the drug. The result has been "a significant increase in narcotics removal" in drug-transit areas off South and Central America, the Coast Guard said. During fiscal year 2016, the Coast Guard set a record by seizing more than 443,000 pounds of cocaine bound for the US. The service says it is on pace for another record-setting amount of seizures this fiscal year, though officials have warned that it doesn't have the resources to fully address the trafficking activity it detects. Take a look inside what Colombian drug smugglers use to carry tons of cocaine across the sea. And how arm forces hunts them down. The ocean area from Colombia to the Galapagos and up to the Mexican and US coasts is about the size of the continental US, Vice Adm. Charles Ray, the Coast Guard's deputy commandant for operations, said at a hearing earlier this month. "On any given day we'll have between six to 10 Coast Guard cutters down here," Ray added. "If you imagine placing that on [an area the size of] the United States ... it's a capacity challenge." US officials believe about 90% of the cocaine shipped to the US traverses the sea at some point, typically arriving somewhere in Central America or Mexico and being smuggled over the US-Mexico land border. The Drug Enforcement Administration says about 93% of the cocaine sent to the US comes through the Mexico/Central America corridor. US anti-narcotics officials also think they intercept about one of every four tons of cocaine headed for the US, with about 69% of it stopped in the eastern Pacific Ocean. 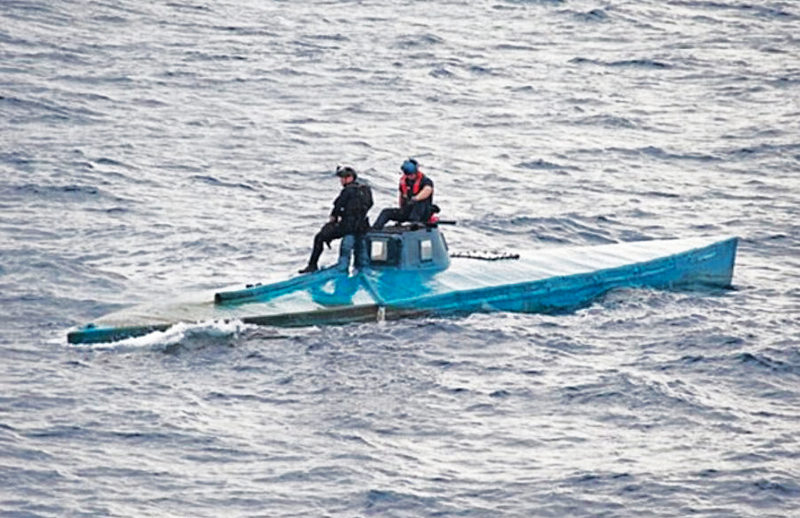 Narco subs — a category that includes fully submersible vessels, semi-submersible vessels, or towed containers — appeared in the 1990s, as Colombian smugglers sought to stay ahead of law-enforcement's detection abilities. Fully submersible and semi-submersible vessels are hard to detect and expensive to build (though their cargos are valuable enough that a single trip can cover the price), so interceptions of them are not that common. 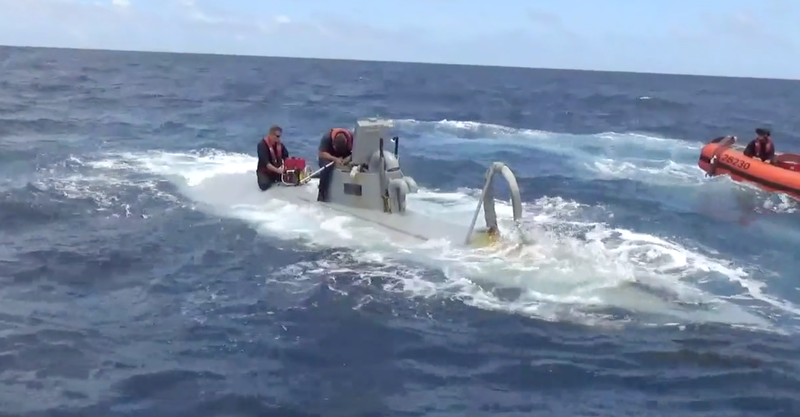 A Coast Guard cutter Stratton boarding team investigates a self-propelled semi-submersible off the coast of Central America, July 19, 2015. 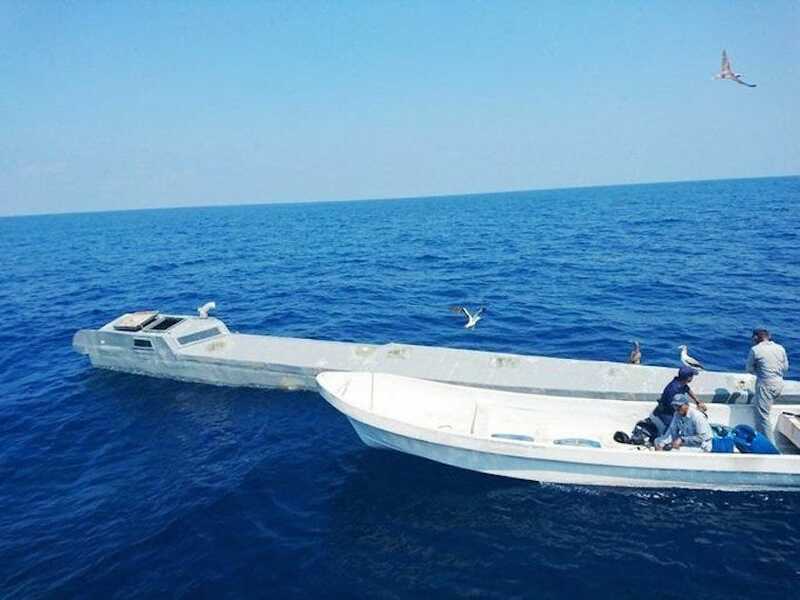 Low-profile vessels, which are not technically semi-submersible, are the majority of seized drug-smuggling vessels, according to a 2014 report. Low-profile vessels can come in various forms, often balancing speed and stealth in different ways. A more recent variation appears to be what naval expert HI Sutton called "very slender vessels" — elongated vessels that go through waves rather than over them. In April, Guatemalan forces found an abandoned vessel that appeared to be a VSV, as did the crew of the Waesche in June. VSVs sacrifice cargo size for stealthiness and speed, and their appearance suggests a maturation in the designs of Colombian traffickers — in particular Los Urabeños, the country's most powerful criminal group — Sutton notes. Narco subs are typically constructed near Colombia's Pacific coast, assembled under cover of jungle canopy. They're moved through rivers and mangroves to the coast once completed, and their smuggling routes typically take them out into the Pacific — sometimes around the Galapagos Islands — before turning north. "In recent years, 'narco-sub' vessels (mostly LPVs) have been built with upper lead shielding which helps to minimize their heat signature and hence they can evade infrared sensors," according to a 2014 paper in Small Wars Journal. "Some of the newer models have piping along the bottom to allow the water to cool the exhaust as the ship moves, making it even less susceptible to infrared detection." In addition to the Coast Guard air and sea assets deployed to stop traffickers, US Customs and Border Patrol have eight P-3 Orion maritime patrol aircraft converted into Long Range Trackers. The former Navy aircraft have been upgraded with radars originally designed for the F-16 fighter jet, as well as optical sensors.